I have been going to do these for SO long. I mean, really long time. I finally decided today was the day. I needed a sweet treat and heck, why not, right? I considered that this was to easy of a recipe to post. And then, I realized, some people must have the instructions, they must. I wonder if I was ever like that? Give me instructions and you can bet I am straying away from them, ESPECIALLY if they are in writing! HA! Youngest child syndrome, it controls my life friends, it CONTROLS my life. You can use, milk, dark, semi sweet, or white chocolate for me. In my world, there is nothing besides milk and white, so I used both, one for dipping and one for decorating. I mean if you groove on dark chocolate or semi-sweet chocolate, go with it. OMG you could mix peanut butter and milk chocolate............oh. OH. OH. Now the good thing about this "recipe" is that you won't need a whole bag of chips. There will be plenty to snack on at midnight, in your bed, in the closet, whatever. Is it wrong that I forgot to tell you how many I got from this batch? I am goign to say 16-20 depending on how big your chips are. Speaking of chips, you MUST (in my opinion) use WaVy chips! They are sturdier and well, that is what I recommend. In a small bowl pour in your chocolate chips, and vegetable oil. Microwave 30 seconds at a time, stirring each 30 seconds until melted. You could do this in a double broiler too. To much hassle for me though. While it is melting sort out your chips. You want the unbroken, unscathed, pure perfection potato chips. Ok well, I want those, you can use whichever ones you want. Do not use tongs for this, no forks, no toothpicks. Scrub your hands and then get those fingers in there. Dip one side, hold on to the wet chocolate and dip the other, it will even out when you lay it down and nobody will know your paws were on it. Ever. Work fast and make sure to let it drip the extra chocolate. 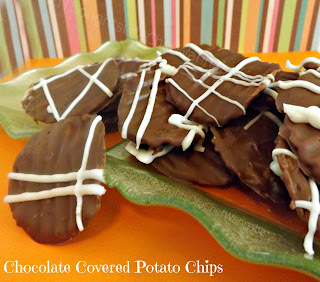 Lay onto a foil or parchment lined cookie sheet. Do this with all of them and refrigerate for 30 minutes. 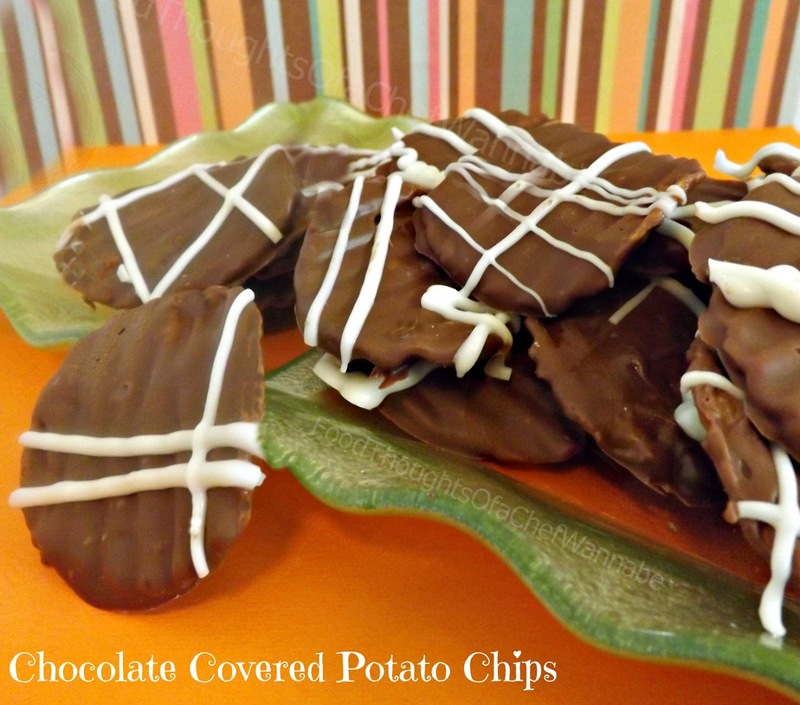 Meanwhile, back at the microwave, put your white chocolate chips or candy melts in a small Ziploc bag. Microwave 20 seconds at a time until they are melted. Snip the TINIEST bit off the corner and drizzle those pretzels with ribbons of beautiful white chocolate!! Any designs you want, I just did a basic ziggy, zaggy, crissy, crossy sort of thingy. Refrigerate another 15 minutes and serve. If you have a cool place to keep these, perfect otherwise leave them in the fridge until you are ready to eat! Enjoy your treats, trust me, it is delicious! - Your "I am SOOO Not Showing These To My Husband" Compadre. They look so yummy. And so simple.